Still throwing away the yolks? Bad idea... even your gains would benefit from the very part of the egg where most of the nutritional value is hidden. You will have read it in the Facebook News already (if you didn't subscribe, yet, I can only recommend you head over to facebook.com/suppversity right away): whole eggs build more muscle than egg whites. If that's true, generations of bodybuilders and fitness enthusiasts have literally thrown away their gains by separating and trashing the yolks of their beloved (? how one can love egg-whites, only is beyond me, anyway ?) egg-whites. Whole eggs for whole gains... (Vliet 2017) -- Despite identical amino acid levels and mTOR/co levels, the whole egg group in a recent study saw significantly larger increases in muscles protein synthesis than the iso-nitrous (=same 18g of protein) egg white only group. The authors, scientists from the University of Illinois at Urbana-Champaign and the University of Toronto had aimed to compare the whole-body and muscle protein metabolic responses after the consumption of whole eggs with egg whites during exercise recovery in young men. To this ends, Vliet et al. recruited 10 resistance-trained men [aged 21 ± 1 y; 88 ± 3 kg; body fat: 16% ± 1% (means ± SEMs)] for a cross-over trial (meaning that everyone received both treatments, so that you can subsequently compare individual responses, too). Plasma appearance rates of protein-derived leucine were more rapid after the consumption of egg whites than after whole eggs (P = 0.01). Total plasma availability of leucine over the 300-min postprandial period was similar (P = 0.75) between the ingestion of whole eggs (68% ± 1%) and egg whites (66% ± 2%), with no difference in whole-body net leucine balance (P = 0.27). Both whole-egg and egg white conditions increased the phosphorylation of mammalian target of rapamycin complex 1, ribosomal protein S6 kinase 1, and eukaryotic translation initiation factor 4E–binding protein 1 (the usual markers of protein synthesis of which you've learned previously at the SuppVersity that they are no reliable marker of protein synthesis in young men) during postexercise recovery (all P < 0.05). 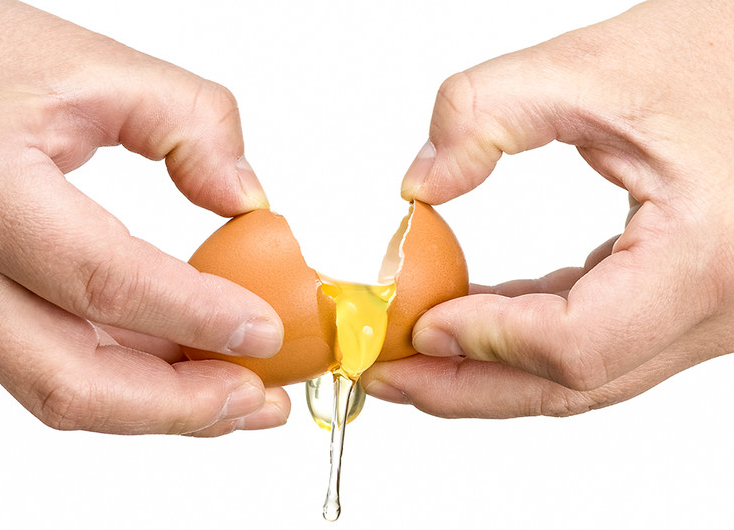 So far, so expected: What wasn't expected, however, was that the "whole-egg ingestion increased the postexercise myofibrillar protein synthetic response to a greater extent than did the ingestion of egg whites (P = 0.04)" (Vliet 2017). 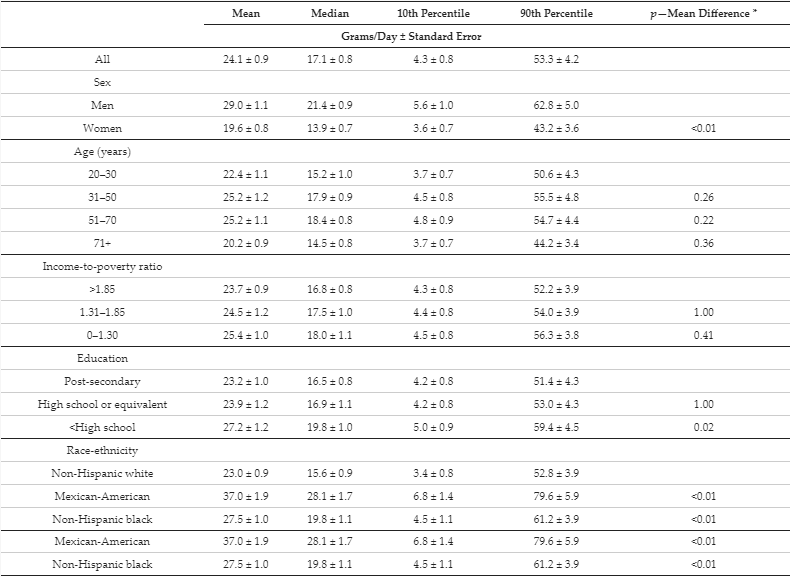 Table 1: Mean and percentiles of egg consumption by sociodemographic group, NHANES 2001–2012 (n = 29,694 | Conrad 2017). Are people eating eggs again? That was the question scientists from the USDA tried to answer earlier this year. In their paper in Nutrients, Zach Conrad et al. (2017) used data of 29,694 U.S. adults from the National Health and Nutrition Examination Survey, 2001–2012 and found that (1) mean egg consumption increased overall from 23.0 (95% CI, 20.8–25.2) g/day in 2001–2002 to 25.5 (22.7–28.4) g/day in 2011–2012 (p = 0.012). No differences in the odds of egg consumption were observed by income level, or food security status. Other variables, however, mattered: women eat fewer eggs than men, so do non-hispanic whites compared to Mexican-Americans etc. (see Table 1). In line with Vliet et al's. observation that "popular practice may still dictate the discarding of the yolk when multiple eggs are consumed in a meal", Conrad et al. suggest further research to examine factors that influence egg consumption and associated nutrient intake - in other words: they want to find out how they can get people to eat more of this nutritious food. Figure 1: Myofibrillar protein synthesis rates in the fasted state and after resistance exercise and consumption of egg whites or whole eggs in young men (n = 10/condition). The inset shows the temporal responsiveness of myofibrillar protein synthesis rates during the early (0–120 min) and late (120–300 min) period (Vliet 2017). 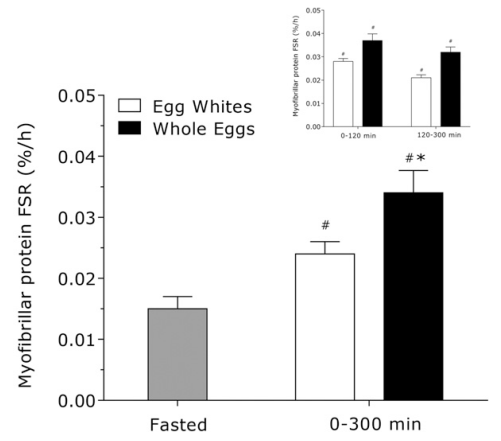 More specifically, as you can see in Figure 1, the cumulative (0–300 min) myofibrillar protein fractional protein synthesis (FSR) increased above fasted values (0.07% ± 0.011%/h) to a greater extent after whole-egg ingestion (0.13% ± 0.017%/h; 2.1- ± 0.3-fold above fasted) than after egg white ingestion (0.086% ± 0.006%/h; 1.6- ± 0.3-fold above fasted) (time effect: P = 0.001; time 3 condition: P = 0.05). That's a relative difference of 46% for the 5h period occuring despite a more rapid appearance of leucine in the blood, with egg whites (one that didn't affect the 0-120min protein synthesis in favor of the whites, though | there's already a 43% advantage for whole eggs after only 2h). Remember: Whether and to which extent these differences in fractional protein synthesis rates would materialize in increased gains over weeks and months is not clear. 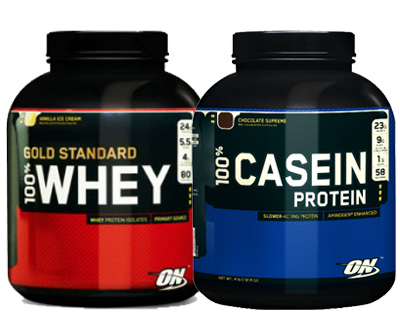 Whey + Casein - Superior Post-Workout Shake in Theory (Fast+Slow) +Practice (Results of a 10-WK Study) | more! What is clear, however, is that this is another instance where "faster" doesn't equal "better" for protein synthesis. You will, after all, remember that it's the combination of both, fast and slow proteins, that yields maximal muscle gains (Whey + Casein = Superior PWO Shake). If there are other underlying factors that could explain the difference, e.g. one of the multiple micronutrients which reside exclusively in the egg yolks isn't clear (see the authors' list of candidates mentioned towards the end of this part of today's egg-ology article). 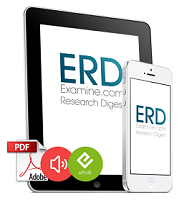 What can be said with a significant degree of certainty, on the other hand, is what was not responsible: significant inter-treatment differences of the diet and an overall reduction in protein uptake as it has previously been observed when egg-whites were consumed in isolation (=the absence of other nutrients/foods) due to an insufficient production of stomach acid/digestive enzymes. How do we know that? Well, the former was assessed by food logs (also: we're talking about the same subjects tested twice); and if the last-mentioned difference had existed, there would be differences between the total amount of dietary protein–derived leucine that became available in circulation throughout the 5-h postprandial period. This, however, was - within the usual margin of statistical error - identical for the egg white (68% ± 1%) and whole-egg (66% ± 2%) conditions. Need another reason to recommend eggs to your clients? They tend to replace unhealthier foods! In type II diabetics, who are still falsely told to avoid eggs (see next study in this egg-o-logy update), the inclusion of eggs is associated with reduced consumption of refined grains nearing statistical significance (−0.7±3.4 vs 0.7±2.2; p=0.0530), a significant, health-promoting increase in total protein foods (0.3±0.7; p=0.0153) - with opposing effects (including surprising reductions in dairy consumption) in response to the exclusion of eggs from their diets (−1.3±2.9; p=0.0188). Accordingly, the authors conclude that their "study may serve as guidance to nutrition researchers and professionals who provide dietary guidance to people with type 2 diabetes on foods to displace when including eggs in their diets" (Njike 2017). As previously hinted at, the proteins in the mTOR cascade didn't show treatment differences, either, and suggest, as the scientists rightly point out that "this anabolic pathway was maximized from the previous performance of resistance exercise and food ingestion" (Vliet 2017). This makes it at least significantly less likely that the differences can be explained by the use of an insufficient amount of protein (you will remember that some studies suggest that you need more than 20g of high leucine protein - and eggs are not exactly high - to maximize protein synthesis). 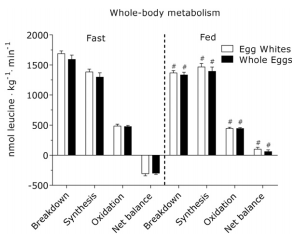 Figure 2: The plot of the whole-body leucine metabolism refutes the assumption that the increased energy intake w/ whole eggs reduced the amino acid catabolism and thus contributed to increased FSRs (Vliet 2017). ...we are left without a confirmed explanation for the superiority of whole eggs, as of now. Vliet et al. are yet right to point out that everything points towards "'extra' nutritional food constituents" as the underlying reason for one or both of the inter-treatment differences: (a) the marginal differences in absorption kinetics - with a more rapid appearance of leucine in the egg white, only, group, and (b) the (subsequent?) increase in FSR in the whole vs. egg white, only, group. Potential candidates the scientists list are: microRNAs (learn more), vitamins & minerals, and lipids [e.g., phosphatidic acid, palmitic acid, and DHA] - all of them may, theoretically, have modified pathways related to transcriptional or protein translational control. With significantly different results from observational studies, a re-analysis of the relationship between egg consumption (and dietary cholesterol) and the risk for cardiovascular diseases (CVDs) in individuals with type 2 diabetes was almost overdue. Table 2: Evaluation of the risk for bias in randomized controlled trials that assessed the impact of egg consumption on cardiovascular risk factors in subjects with type 2 diabetes (Richard 2017). ...the majority of studies found that egg consumption did not affect major CVD risk factors in diabetic patients. In fact, the consumption of 6 to 12 eggs per week had no impact on plasma concentrations of total cholesterol, low-density lipoprotein-cholesterol, triglycerides, fasting glucose, insulin or C-reactive protein in all studies that reported these outcomes in comparison with control groups, at all. 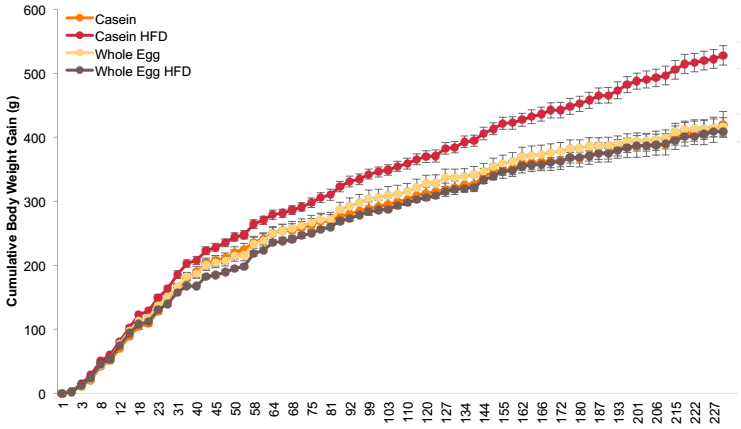 Figure 3: Whole Egg High Fat Diet: Cumulative Body Weight Gain. The sign. differences occured in the absence of differences in food intake between the casein vs. whole egg powder groups (Hahn 2017). A new model study even suggests that eating more whole eggs may be an effective dietary strategy to attenuate both, diet and gene-related diabesity. Accordingly, the study's authors criticize the still prevalent controversy about the consumption of whole eggs by those with T2D. After all, their experiments on the relationship between the consumption of whole eggs and obesity in both a genetic-mediated and diet-induced (i.e., high fat feeding) T2D obese rat model show quite convincingly: (1) eggs reduce weight gain(40% decrease in diet-induced obesity, 20% reduction in genetic diabesity model) and (2) cut significant amounts of body fat (4-5%). An increase in high-density lipoprotein-cholesterol with egg consumption was observed in 4 of 6 studies. Results from randomized controlled trials suggest that consumption of 6 to 12 eggs per week, in the context of a diet that is consistent with guidelines on cardiovascular health promotion, has no adverse effect on major CVD risk factors in individuals at risk for developing diabetes or with type 2 diabetes. However, heterogeneities in study design, population included and interventions prevent firm conclusions from being drawn... and yes, skepticism may remain due to the involvement of the Egg Nutrition Center/American Egg Board, the Australian Egg Corporation, and the Egg Nutrition Center in all studies (but hey, someone has to pay for the studies if the government refuses to acknowledge that its over-generalized anti-cholesterol advice has misled people for decades). 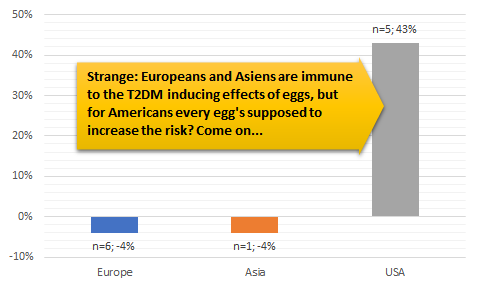 Against that background, we do at least have to raise the question why only US studies find strong positive associations between egg consumption and T2DM, while all Asian and European studies don't (Schwingshackl 2017). Figure 5: Plasma choline (a) and trimethylamine-N-oxide (TMAO) (b) concentrations following a 2-week washout period (0 eggs/day), and after consuming 1, 2, and 3 eggs/day for 4 weeks each as part of a randomized cross-over trial, which refutes the claim that eggs will increase TMAO based on acute phase studies like Cho 2017. Values are presented as means ± SD for n = 36 young, healthy men and women. Bars with different superscripts differ at P < 0.05 as determined by repeated measures ANOVA with LSD post hoc analysis and adjustment for multiple comparisons (DiMarco 2017). What's left to say? Well, (a) whole eggs seem to be more anabolic than egg whites alone. They are (b) not a toxic and pro-diabetic heart killer. And (c) the last hitherto not directly addressed issue that their high choline intake could act not just as a heart-disease promoter, but also as pro-carcinogen, because it will increase trimethylamine-N-oxide (TMAO) has just recently been disproven by a 14-week crossover study with thirty-eight subjects [19 men/19 women, 24.1 ± 2.2 years, body mass index (BMI) 24.3 ± 2.5 kg/m2] in which the subjects consumed 1, 2, and 3 eggs/day for 4 weeks, each. In fact, even though that was a US study, the results were nothing but beneficial: BMI, waist circumference, systolic BP, plasma glucose, and plasma triacylglycerol did not change throughout the intervention. Diastolic BP decreased, HDL levels increased, LDL levels dropped and the LDL-c/HDL-c ratio improved significantly (P < 0.01), when the subjects ate 1-3 eggs/d. 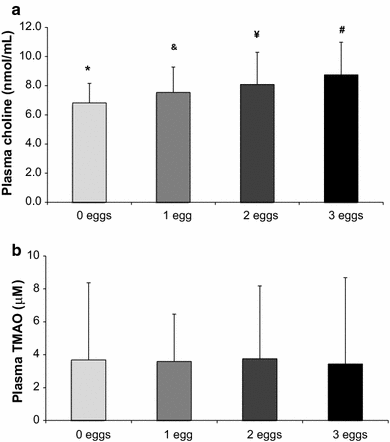 Similarly, the plasma choline increased dose-dependently with egg intake (P < 0.0001). The fasting plasma TMAO levels and thus any potential heart-disease or cancer risk was yet unchanged | Comment! Cho, C. E., Taesuwan, S., Malysheva, O. V., Bender, E., Tulchinsky, N. F., Yan, J., ... & Caudill, M. A. (2017). Trimethylamine‐N‐oxide (TMAO) response to animal source foods varies among healthy young men and is influenced by their gut microbiota composition: A randomized controlled trial. Molecular nutrition & food research, 61(1). DiMarco, D. M., Missimer, A., Murillo, A. G., Lemos, B. S., Malysheva, O. V., Caudill, M. A., ... & Fernandez, M. L. (2017). Intake of up to 3 Eggs/Day Increases HDL Cholesterol and Plasma Choline While Plasma Trimethylamine-N-oxide is Unchanged in a Healthy Population. Lipids, 52(3), 255-263. Greenhaff, P. L., Karagounis, L. G., Peirce, N., Simpson, E. J., Hazell, M., Layfield, R., ... & Rennie, M. J. (2008). Disassociation between the effects of amino acids and insulin on signaling, ubiquitin ligases, and protein turnover in human muscle. American Journal of Physiology-Endocrinology and Metabolism, 295(3), E595-E604. Hahn, K., Coonts, C., & Reed, C. (2017). Whole Egg Consumption Attenuates Weight Gain in Obese Type 2 Diabetic Rats. Njike, V. Y., Annam, R., Costales, V. C., Yarandi, N., & Katz, D. L. (2017). Which foods are displaced in the diets of adults with type 2 diabetes with the inclusion of eggs in their diets? A randomized, controlled, crossover trial. BMJ Open Diabetes Research and Care, 5(1), e000411. Richard, C., Cristall, L., Fleming, E., Lewis, E. D., Ricupero, M., Jacobs, R. L., & Field, C. J. (2017). Impact of Egg Consumption on Cardiovascular Risk Factors in Individuals with Type 2 Diabetes and at Risk for Developing Diabetes: A Systematic Review of Randomized Nutritional Intervention Studies. Canadian journal of diabetes. Schwingshackl, L., Hoffmann, G., Lampousi, A. M., Knüppel, S., Iqbal, K., Schwedhelm, C., ... & Boeing, H. (2017). Food groups and risk of type 2 diabetes mellitus: a systematic review and meta-analysis of prospective studies. Vliet, et al. (2017) "Consumption of whole eggs promotes greater stimulation of postexercise muscle protein synthesis than consumption of isonitrogenous amounts of egg whites in young men." AJCN. First published ahead of print October 4, 2017 as doi: 10.3945/ajcn.117.159855.